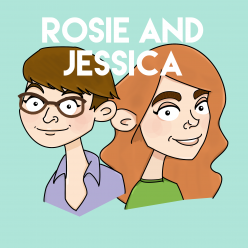 In episode 83, Rosie and Jessica have brought packed lunches and activities for some literal days of fun. Rosie’s been to some all-day comedy and Jessica’s tidied her kitchen. All good fun. They see the good in people with their Top 5 Friendly Monsters and discuss their dream Bake Off All Stars line-ups. Jessica picked My Baby Just Cares For Me by Nina Simone, while Rosie went for Genghis Khan by Miike Snow. Is this Elmo or an existential crisis? Sixties girl group baby shower cake toppers! Rosie has several projects on the go, including a now complete badger tea cosy, some socks and a shawl with lots of bees in it. Make sure you line your stomach with a good dinner before you watch the Epcot Challenge: Drinking Around the World with Lindsay “Nostalgia Chick” Ellis. Rosie lowers the tone of this Twitter round-up on The Poke.